Liz at Lancaster has had excellent reviews on Tripadvisor . 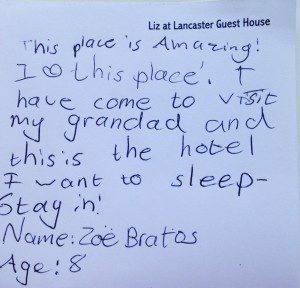 So after reading our reviews, if you need any further encouragement to come and stay, here are 10 more reasons why families like staying at Liz at Lancaster Guesthouse. 2. All the units have enclosed courtyards so little ones are contained and also don’t invade other guests’ privacy. 3.Because all units have fully equipped kitchennettes/kitchens, parents can prepare meals for youngsters. 4.The front garden has been used to kick a soccer ball and the activity at the bird tray is always a source of fascination. 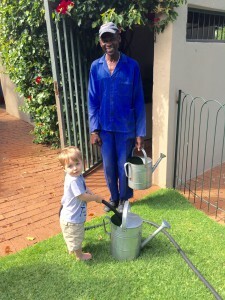 We have several photos of adoring little boys following Alick around as he waters the garden. It takes me back to my sons at that age – some 35 years ago – when they helped Alick in the garden. And yes, Alick has been with us that long. 5. 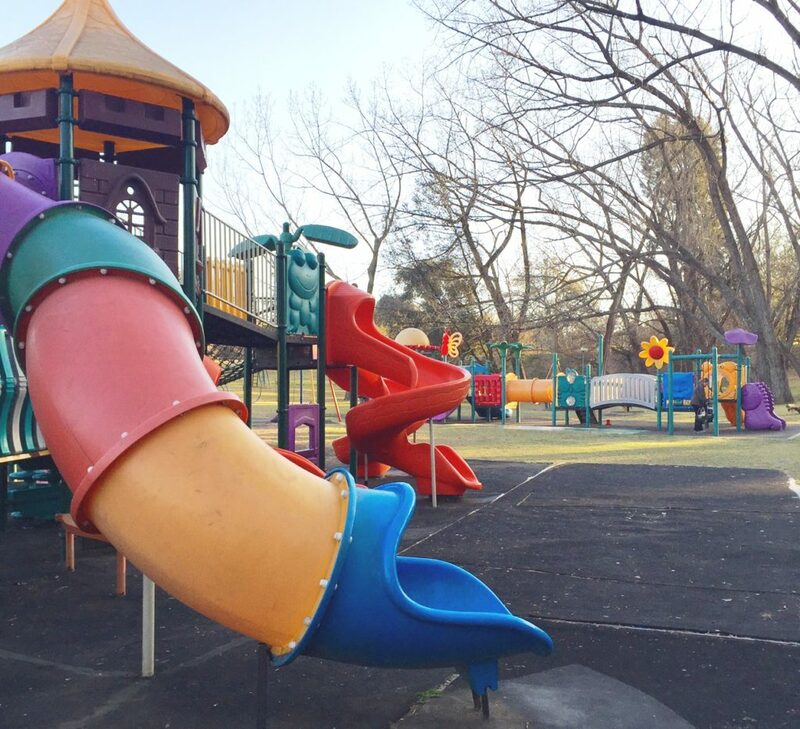 Toddler equipment is available: from camp-cots, to high chairs and ….. even potties. 6. With Liz having 2 grandchildren there are lots of books and toys to borrow. New things are always a great attention grabber for little ones! 7.We have satellite TV with a children’s channel. 8. 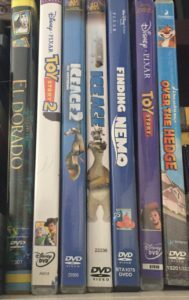 We also have a DVD library with several DVDs especially suitable for children. All the units have DVD players. A DVD can make for a few hours of welcome ‘quiet time’. 9. Several guests have asked Catherine to babysit in the evenings. Needless to say little kids love her! 10. There are several child-friendly restaurants within walking distance. Delta Café is 5 blocks away. 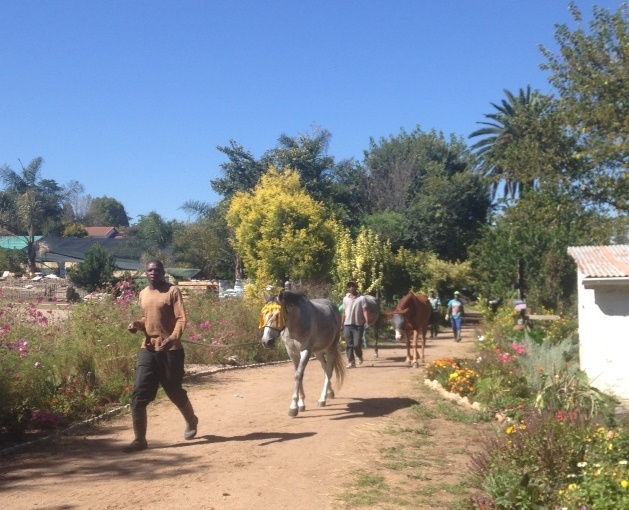 Apart from a small playground, kids can see the chickens and horses at the stables. And at AJ’s in the Park, there’s a jumping castle a large open field and over week-ends, child-minders to help with the children. 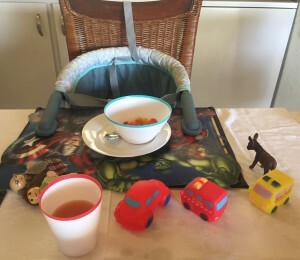 And finally an added bonus, Liz explores Joburg with her little grandsons, so has lots of ‘in the know’ ideas about how to entertain youngsters. There are so many wonderful options from indoor play areas (for those occasional rainy days) to farmyards, to great kids bookshops, to children’s theatre. 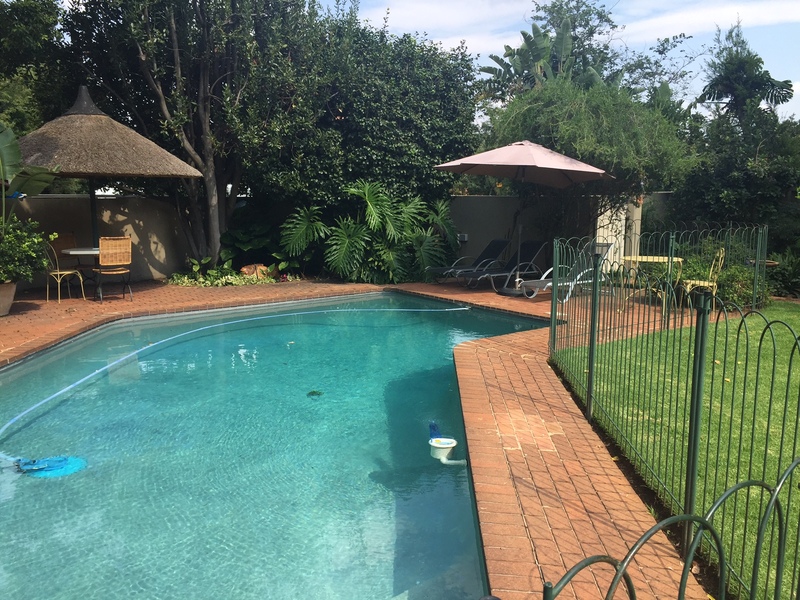 Do you need any more reason to book at Liz at Lancaster when next visiting Joburg with your family. Gosh Liz that’s great for kids. But what about us ! Bridge I suppose. But I don’t play that game. Lots of love T.
Well we have 1000 piece jigsaw puzzles; a lending library of over 100 DVDs, a small library of books of SA interest, loungers by the pool and an honesty bar! that should be enough for adults?